MINNEAPOLIS, Minnesota (CNN) -- The deadly outbreak of salmonella traced to a Georgia peanut plant was fueled by poor oversight by food safety regulators and a slow response by federal agencies, state health officials and outside experts say. Amid a recall, the FDA has begun a criminal inquiry into the Peanut Corporation of America's Blakely, Georgia, plant. Eight deaths have been linked to the outbreak, which has sickened at least 575 people in 43 U.S. states and one in Canada. Thousands of peanut products have been pulled off store shelves since mid-January. But the first cases occurred more than four months earlier -- and critics say the federal Food and Drug Administration stepped in too late to prevent a bigger problem. "It's pretty frustrating when you have cases where you have onsets starting back in September and you don't get a recall until January," said Stephanie Meyer, an epidemiologist with the Minnesota Department of Health. Minnesota authorities identified peanut butter as the culprit in the outbreaks in early January. Among the deaths linked to salmonella was that of 72-year-old Shirley Almer of Perham, Minnesota, who died December 21. "They said 'Your mother had a stool sample tested, and she tested positive for salmonella,' " said her son, Jeff Almer. "We were just, like, 'What?' It was stunning to hear that. How could that have happened?" Almer's family is suing the Peanut Corporation of America, whose plant in Blakely, Georgia, has been identified as the source of the outbreak. The FDA is urging that every product produced there since the beginning of 2007 be thrown away. Food safety experts said the underlying cause of the problem, however, is that the century-old system of regulation is broken. In this case, the experts said, the federal government failed to oversee the safety of products coming out of the Blakely plant and was slow to identify it as the source of the salmonella. The first problem is that almost nothing can stop companies from shipping contaminated food, said William Hubbard, a former FDA associate commissioner who testified before a Senate committee Thursday. "American food processors are able to essentially make anything they want, any way they want, and the burden is on the FDA to find a problem and correct it," Hubbard said. "It should be the other way around, in which the food processor is told, 'You need to prevent contamination of your food before you enter it into the food supply.' "
The second problem, he said, is that there are not enough federal inspections of food plants. 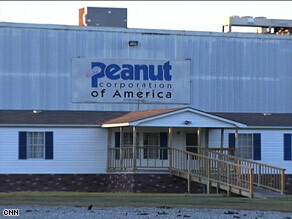 According to the FDA, it last inspected PCA's Blakely plant in 2001, before the company started producing peanut butter. It relied on state inspectors to review the factory in 2006, 2007 and 2008 -- and those inspections showed unsanitary practices the FDA later said were "somewhat resolved." "It was not until 2007, when the plant was inspected under FDA contract by the Georgia Department of Agriculture, that we recognized that in addition to just producing peanuts, they were producing peanut butter and peanut paste," Dr. Steve Sundlof of the agency's Food Safety and Applied Nutrition center told the Senate Agriculture Committee on Thursday. When federal officials obtained the company's records, they discovered that 12 times in the past two years the company knowingly shipped products that initial tests showed were contaminated with salmonella. But the Virginia-based company denied it shipped dangerous products, and said follow-up tests showed its products were salmonella free. It said it paid for private inspections in 2008 that gave the plant "superior" and "excellent" ratings. "Our top priority has been -- and will continue to be -- to ensure the public safety," the company said. It said it is "continuing to work day and night with the FDA and other officials to determine the source of the problem and ensure that it never happens again." However, Georgia Agriculture Commissioner Tommy Irvin said in January that if a food product tests positive for salmonella once and another test comes back negative, "You believe the one that is positive." Irvin said once salmonella is found in a product, "That lot should be destroyed, but wasn't." According to the FDA, federal officials depend on manufacturers themselves to safeguard the food they make. The agency steps in when it learns that "adequate steps have not been taken and there is a potential for food contamination," Sundlof said. "More should have been done by this company," he said. "Obviously, their sanitary measures were inadequate to prevent salmonella from entering their product, and it is the responsibility of the food industry to produce safe food." The outbreak also has turned a spotlight onto how food products get recalled -- another issue that experts say needs to be fixed. "The FDA does not have authority to force a manufacturer who's producing contaminated food to recall it," Hubbard said. "They can beg them to, but they cannot order them to -- and that's a flaw in the system." Minnesota health officials said recalls should have taken place much earlier in this case, but disagreements between state and federal officials delayed them. The first, limited recall from the company came on January 10, a day after Minnesota officials publicly linked peanut butter made by PCA to the outbreak. Meyer said her agency told the FDA that it suspected peanut butter from the Blakely plant and asked for help, but the FDA wanted better evidence. Other officials said the Centers for Disease Control also failed to recognize the source of the outbreak fast enough. The CDC first noticed clusters of salmonella cases in November. But because there are no federal standards or mandatory guidelines that states must follow to detect food-borne illnesses, many states had trouble figuring out why people were getting sick. Dr. Michael Osterholm, a former head epidemiologist for Minnesota's state health department, said CDC officials were still looking at chicken as a potential source of the outbreak "11 days after Minnesota made the peanut butter announcement." "And you know what? That is irresponsible," he said. FDA officials said they moved as fast as they could given the evidence they had. But Dr. Robert Tauxe, deputy director of the CDC's food-borne bacterial illness division, agreed the system is overly complicated, prone to delays and underfunded. "The reality is that we have 50 different states, each with their own authorities, each with their own processes and each with their own budgets," Tauxe said. Hubbard said the result is "an embarrassment" to a 21st-century nation -- about 5,000 deaths a year from food poisoning, with another 325,000 hospitalized and tens of millions sickened, according to CDC figures. "We are losing the equivalent of the World Trade Center attacks every eight months to food-borne illness," Hubbard said. Almer said no one told him his mother's death was linked to a nationwide outbreak. He read about it in the newspaper. "I even mentioned to my wife, Rebecca, 'That's got to be my mom,' " he said. "And she's like, 'No, no.' And I'm like, 'It's gotta be her, they said she had salmonella.' But I don't know why we weren't told if it is her." In a recent interview, President Obama told NBC, "At bare minimum, we should be able to count on our government keeping our kids safe when they eat peanut butter." Peanut Corporation of America now faces a federal criminal investigation into the outbreak, the FDA announced in January. Company executives are expected to appear before Congress next week. CNN's Miriam Falco and Matt Smith contributed to this report.